From june 26 to december 21st 2014 included. During this period, we only take reservations for 3 nights stay minimum. For a shorter stay, thank you for coming directly to our residencial. 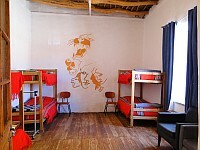 Bed in dorm (6 beds) : $ 10.000 (price in chilean pesos per person and per night). $ 22.000 (price in chilean pesos per room and per night). $ 33.000 (price in chilean pesos per room and per night). $ 44.000 (price in chilean pesos per room and per night). One matrimonial bed and 3 individual beds. $ 55.000 (price in chilean pesos per room and per night). Free accommodation for children under 2 years old, at the rate of only one child per room. Free provision of a baby's bed if necessary. $ 34.000 (price in chilean pesos per room and per night). Please note : The exchange rates given are 'bank rates'. High street rates may be subject to commission. From december 22nd 2014 to may 24th 2015 included. $ 38.000 (price in chilean pesos per room and per night). $ 25.000 (price in chilean pesos per room and per night). $ 50.000 (price in chilean pesos per room and per night). $ 38.000 if occupied only by 3 persons. One matrimonial bed and additional individual beds. 2 adults + 2 children : $ 44.000 (price in chilean pesos per room and per night). 2 adults + 3 children : $ 55.000 (price in chilean pesos per room and per night). 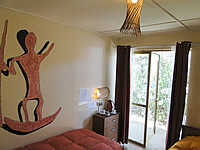 2 adults + 4 children : $ 66.000 (price in chilean pesos per room and per night). 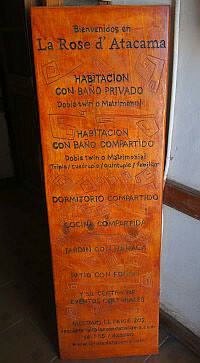 2 adults + 5 children : $ 77.000 (price in chilean pesos per room and per night). 5 adults : $ 62.500 (price in chilean pesos per room and per night). 6 adults : $ 75.000 (price in chilean pesos per room and per night). 7 adults : $ 87.500 (price in chilean pesos per room and per night). From may 25th to june 24th 2015 included. 1 night : $ 38.000 (price in chilean pesos per room and per night). 2 nights & more : $ 34.000 (price in chilean pesos per room and per night). - 1 night : $ 25.000 (price in chilean pesos per room and per night). - 2 nights & more : $ 22.000 (price in chilean pesos per room and per night). - 1 night : $ 50.000 (price in chilean pesos per room and per night). - 2 nights & more: $ 44.000 (price in chilean pesos per room and per night). - 1 night : $ 38.000 (price in chilean pesos per room and per night). - 2 nights & more : $ 33.000 (price in chilean pesos per room and per night). - 1 night: $ 44.000 (price in chilean pesos per room and per night). - 2 nights & more : $ 40.000 (price in chilean pesos per room and per night). - 1 night : $ 55.000 (price in chilean pesos per room and per night). - 2 nights & more : $ 50.000 (price in chilean pesos per room and per night). - 1 night : $ 66.000 (price in chilean pesos per room and per night). - 2 nights & more : $ 60.000 (price in chilean pesos per room and per night). - 1 night : $ 77.000 (price in chilean pesos per room and per night). - 2 nights & more : $ 70.000 (price in chilean pesos per room and per night). 5 adults : $ 55.000 (price in chilean pesos per room and per night). 6 adults : $ 66.000 (price in chilean pesos per room and per night). 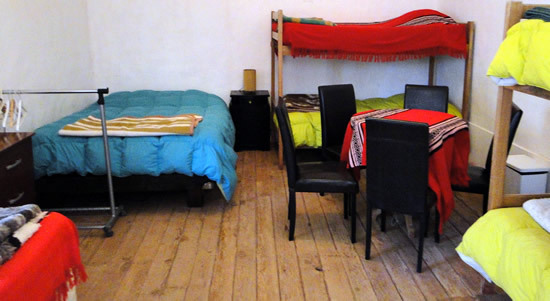 7 adults : $ 77.000 (price in chilean pesos per room and per night). Matrimonial room with private bathroom. From june 25th to august 31st 2015 included. $ 38.000 if occupied only by 3 persons (price in chilean pesos per room and per night). Please be informed that our residencial does not propose service of breakfast. However, you will have at your disposal an equipped kitchen, a close shop and shaded tables to prepare and enjoy your favorite breakfast ! To preserve water ressources in San Pedro of Atacama, and social link in our residencial, we don't and will never have a swimming pool and television. Lockers available in the shared dorm. Common kitchen equipped with cooker, dishes and refrigerator. 3 common showers and 3 common toilets with hot water from 7:00am to 10:00pm (a reserve offers water supply if there is no water in the village). Pillows, sheets and blankets supplied for all the types of accommodation. Bath towels supplied only in the rooms with private bathroom. 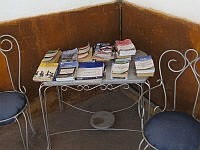 Tea, coffee, sugar, cups and termos supplied in the rooms with private bathroom. Garden with hammocks and deckchairs. A guitar if the desert inspires you. Advises and good plans of all kinds of things in San Pedro de Atacama. The "family" rooms have matrimonial bed. To make your demand of availability at La Rose d'Atacama, fill the form here. Paiement by credit card only from minimum 50.000 chilean pesos, and 5% tax.